Does anyone know who the OU Special Teams coach is? They sure need some work! Did our defense even bother to show up? Brent Mussberger did better last night, but he stilled showed a bias against the Sooners. Why can't ABC hire a non-partisan commentator? I blame the Democrats. Now, we wait to see if we get to play in the conference championship. Now THERE'S a strange way of determination! Y'all better jump Texas, and then y'all better win the Big 12. I don't want to see Texas anywhere near the national championship game and I don't want to see Ohio State in a BCS game. I'm right there with you, bro! So I was sitting at my grandmother's house in Edmond working on a paper for grad school. My dad called and he said he didn't feel good and he wasn't going to Bedlam. I said very funny... what a cruel joke. My dad said he was serious! So I met my dad in Bricktown (he lives in Norman) to pick up his tickets. Then headed back north. On the way to Stillwater, (while I was still in OKC) I encountered the OU team bus with police escorts. I followed the team and the escorts all the way to Stillwater. Let's just say I made record time! The game was amazing! I still can't believe I got to go! 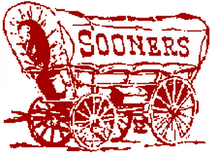 Boomer Sooner!!! poor texas! Wow, Shannon. That's a fun story! It was an amazing game to watch. Over 1000 yards, over 100 points, and all those consecutive touchdowns - both sides played HARD. Sam was amazing. I liked his arial moves! Too bad about Box. I'm very glad you had a good time!